We’re well aware that heat is pretty much unavoidable for both you and your clients. So listen closely… ghd have a secret! and it’s styling hair using an optimum temperature of exactly 185º. Anything over will crack hair cuticles resulting in tangles and split ends, and anything lower will dry the hair out. It’s no secret that what you put in your body shows on the outside. So, do your clients know about the different vitamins needed to maintain healthy hair? We’ve done our research and found B vitamins, Zinc, Copper, Manganese and plenty of Selenium keep hair strong and healthy. We also think it’s important to mention the benefits of water. It goes without saying that if we don’t drink enough our bodies become dry and as as result, so does our hair. We’re sure you love your products and your clients have their favourite ones. But, careful of sillicone-based products – they can often cause more harm than good! Well, ghd’s head of education, Jo Robertson has recommended a few products to help minimise the damage. First up, she suggests the ghd platinum styler which maintains a continuous heat of 185º across the plates. Nice! 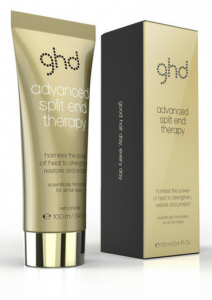 Plus, ghd’s heat-activated advanced split end therapy treatment leaves hair smooth and soft for up to 10 washes. 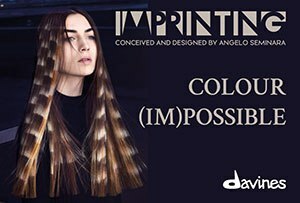 It works by filling and binding broken hair fibres together which leads to an instant fix of split ends. Neat, isn’t it? Your clients will love it, trust us.